To celebrate National Toasted Marshmallow Day (August 30), we toasted up a Chocolate Chipetta Marshmallow from Plush Puffs—that’s right, a chocolate marshmallow with mini chocolate chips—and made a deluxe S’more by sandwiching it between LU’s Little Schoolboy tea biscuits, the ones topped with chocolate bars. They’re so good, we’ll continue the celebration through Labor Day Weekend! So many salsas, so little time! That’s why we spend the time for you, tasting hundreds of salsas each year to recommend the ones that stand out. Here are three very different salsas, from El Gringo Logo (lots of chunky vegetables), Green Mountain Gringo (piquant with apple cider vinegar) and Mrs. Renfro’s (very smooth and sauce-like, great for cooking as well as dipping). Red salsa, while most familiar to Americans, is just one of dozens of different types of salsa. Check out the salsa universe in our Salsa Glossary. If you didn’t do enough celebrating during July, National Ice Cream Month, you’ve got another chance: August 2 is Ice Cream Sandwich Day. We’ve got suggestions for you, plus gourmet ice cream sandwiches that you can send as gifts (put yourself at the top of the gift list). August 10 is National S’mores Day. 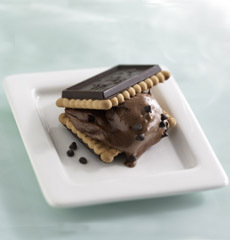 You can throw a heck of a party with our tips and recipes for 7 great S’mores...or buy Recchiuti or Godiva S’mores. See the Table of Contents below, and read about dozens more food holidays plus delicious gourmet foods that help you entertain more easily and put exciting food on the table every day. The month ends on a high note: August 31 is National Trail Mix Day—take a look at our favorite gourmet trail mix. Enjoy the bounty of the season: currants, peaches, raspberries, beets, corn, spinach, string beans (green and yellow) and other delicious things at your farmers’ market. Get the Top Picks e-mailed to you weekly. Is Your Beautiful Crystal Decanter Leaching Lead?